Make the most of your time here in St. Augustine with all the rentals we have to offer. There's no better way to tour the Oldest City than with one of our guided tours. 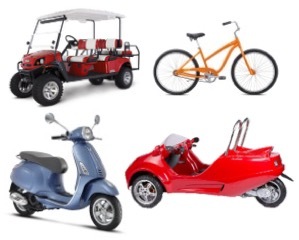 St. Augustine Bike Rentals is your one-stop Bike, Scooter and Golf Cart Rental Agency. We are also the leading provider of interactive Guided Tours in beautiful St. Augustine, Florida. Explore the city with one of our Segway, Bicycle or VIP Golf Cart Tours to truly enjoy your experience here in St. Augustine. We are perfectly located in the heart of the Nation’s Oldest City. St. Augustine Bike Rentals is the best way to experience the history, architecture, culture, and personality of St. Augustine. Join us on a guided Segway , Bike or Street Golf Cart Tour and experience everything that St. Augustine has to offer. St. Augustine Bike Rentals allows you the opportunity to experience the Historic District, while getting away from the main streets. Enjoy the less populated hidden areas and the freedom of exploring the quiet, lesser-known streets that link the well-worn paths. Our Bikes, Scooters, Carts and Segways allow you to get up-close and personal to the many significant destinations in the area. Whether you want an experienced guide, who knows the area extensively or you decide to set out on your own and explore our ancient city, St. Augustine Bike Rentals is the best way to enjoy this gorgeous city. Stop for a while to admire and photograph St. Augustine’s beauty as you learn of its history. Grab a bite to eat at one of the many renowned restaurants in the city and visit some of the top spots such as, the Castillo de San Marcos National Monument (The Fort), the Colonial Spanish Quarter, The Oldest House and the Fountain of Youth Discovery Park. Head over the Bridge of Lions to one of our beautiful beaches and discover the island life of St. Augustine. There you will find the St. Augustine Alligator Farm and Zoological Park and breathtaking Anastasia State Park. I have taken seven previous Segway Tours in other cities around the world and this Segway Tour by Corley from St. Augustine Bike Rentals was the best ever! Corley our tour guide was awesome. He took our group out in inclement weather when most guides may have cancelled. He was very entertaining with his historical knowledge and has a great sense of humor. Corley Chapman allowed us to realize that seeing St. Augustine by their Segway Tour has even more charm than we realized. Had so much fun and learned some history about St. Augustine. Corley was very friendly, had a great sense of humor, very personable, and engaging. I will be bringing a group of my friends back with me. Thank you for a great experience. Great people. Very helpful and friendly. Corley our guide was infinitely patient when helping us learn and to feel comfortable on the segways. He was a real pleasure to be around... I recommend using St Augustine Bike Rentals. It was a lot of fun. So much fun! Sandy H. was our wonderful and well prepared tour guide and segway instructor. Excellent in preparing us for the segway, and provided a vast amount of information about St. Augustine, it's history, it's people. Thank you Sandy!